Norway’s central bank is due to formally launch its new 500- and 50-kroner notes into circulation on Thursday. The new bills, issued in order to introduce more security features to prevent counterfeiting, carry on Norges Bank’s maritime theme that shines through them all. The NOK 50-note literally shines with its image of the Utvær Lighthouse on an island in Solund on Norway’s West Coast, south of Florø. It marks Norway’s most westerly point and also signifies the importance of such maritime landmarks. Utvær began as a pilot station in the 1770s and many more lighthouses were later built along the Norwegian coast, especially in the latter half of the 1800s. They are now “highly visible and cherished landmarks,” states Norges Bank, and represent how the sea has been a crucial part of Norway’s economic development as a traffic and transportation artery. Shipping lanes remain an important part of the transportion network that binds the country together, with lighthouses helping to guide the way. 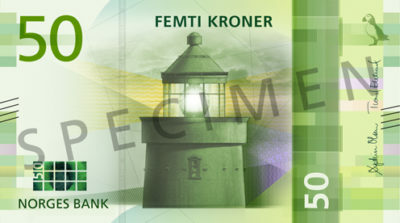 On the back of the new 50-kroner note is another digital depiction meant to represent the beacon from a lighthouse. Both the 50- and 500-kroner notes also contain a drawing of an Atlantic puffin, which breed along the Norwegian coast. The head of the puffin and the value of the currency note are also featured in the watermark used in all demoninations of the new currency series. The new 500-kroner note features the rescue vessel RS 14 Stavanger, designed by Norway’s most famous shipbuilder, Colin Archer, who also designed the famous Fram that sailed to both the North and South Poles. The RS 14 Stavanger was built at Archer’s shipyard in Larvik and launched in 1901, to serve in the fleet of the Norwegian Society for Sea Rescue (Redningsselskapet). The rescue service, the bank states, has played an important role in Norway, where storms and shipwrecks are a part of life for those seeking to harvest the riches of the sea. Today it operates from stations spread all over the country, with more than 40 vessels ready to respond to emergencies at all times. The flip side of the new 500-kroner note offers yet another digital depiction of value for the economy from the sea. Its rectangular design is meant to vaguely represent an oil platform and a depiction of North Sea gas pipelines. Bank officials thought it fitting to feature oil and gas activity that has become “one of the pillars of the Norwegian economy” during the past 50 years. The central bank chose the maritime theme after years of issuing currency that portrayed famous Norwegians through history. The bank has noted that activities associated with the sea and Norway’s long coastline, like shipping and the fishing industry, have long formed the basis for Norway’s economic growth and prosperity. It was only fitting, bank bosses figured, that they be presented on the new series of currency that was first introduced in 2014. The first two denominations in the new currency series, the 100- and 200-kroner notes, debuted last year. The soon-to-be old 500- and 50-kroner notes can still be used for a period of one year, until October 17, 2019. Merchants can then refuse to accept them as they’ll no longer be viewed as legal tender. Norges Bank, however, will be obliged to exchange the withdrawn notes for at least another 10 years. The final NOK 1,000-note in the new currency series will be introduced at the end of next year.